The RSPCA has launched an investigation after four puppies were found dumped in a black plastic bag in a layby in Luton this week. The upsetting discovery was made on the morning of Monday 3 December by a member of the public. The puppies were in a bag in a layby near a cadet hut entrance on Lower Harpenden Road, Luton. All four puppies - two males and two females - were lurcher types and cream in colour, aged between nine to 10 weeks old. They were extremely thin and when the bodies were examined by a vet it was discovered they had no food in their intestines. 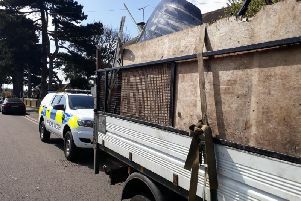 RSPCA animal welfare officer Jane Folly, said: “This was an exceptionally distressing incident to deal with and I want to thank the kind-hearted caller who notified us and removed the bodies until we were able to collect them and have them examined by the vet. “It is always heartbreaking to deal with a dead animal, but what was especially upsetting with this incident was the fact that on examination these pups did not have any food in their stomachs and so one of the causes of death could have been starvation. “There was a lot of straw in the black bin bag as well, which could indicate that they had been kept in some kind of location previously which was covered in straw. “We think it is likely the pups may have been dumped at this location over the weekend, and I am eager to speak to anyone who has any information as to who these pups may have belonged to, or if they saw anyone acting suspiciously at the location. Last year, the animal welfare charities 24-hour cruelty hotline received 55,821 calls over Christmas (1 December - 31 December). More than 8,000 animals spent Christmas in our care last year.